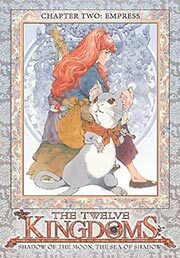 The Twelve Kingdoms is based upon Fuyumi Ono's series of novels by the same name, published by Kodansha. Right from the show's inception, one can tell the level of depth and sophistication behind this incredible series. It makes sense that that there is an entire line of novels behind the storyline. Neither Youko Nakajima nor Yuka Sugimoto were living very fulfilling lives in Japan. The teenage girls didn't have many true friends in school, nor did they care much for their families. Youko spent much of her time striving to be a good girl in the hope that people would like her. She excelled in class, participated in various clubs, but she never truly felt at ease with herself. Yuka chose a more introverted path, shying away from contact with others. She lived most of her life in the various fantasy novels she read as her distasteful life plodded ever onward. A strange man arrived at their school, swore fealty to Youko, and before she knew it, strange monsters were attacking her. To escape the beasts, she followed the man, but before she could really learn anything about him, a phenomenal storm pulled her and her friends out of the reality they once lived in, the reality of Japan. She passes out. In this disc, Youko is still looking for a way back to Japan, though she must combat some personal demons before she can muster the resolve to brave the alien land that throws obstacle after obstacle at her. The story is amazing. The level of detail, the pacing - it makes it easy to fall into this tale. In fact, I have to apologize. Rather than writing a few more reviews this month, I ended up watching this disc, which I was planning on putting off until next March's issue. However, The Twelve Kingdoms is so good, I couldn't stop watching it. I just have to know what happens next. The visuals and animation compliment the top-notch story perfectly. Everything moves with impressive fluidity, and the colors and designs of the world of The Twelve Kingdoms are enchantingly vivid. This is a colorful show, filled to the brim with detail, and much like the recent Lord of the Rings trilogy, it's obvious that the creators cared about the work when they crafted it. When I first heard the opening theme, I knew this show was going to be something special. It is haunting, quiet, epic, and adventurous all at the same time, hinting at the grand nature of the show it's presenting. The soundtrack contains elements of Chinese and Japanese traditional music, but a full symphony backs up both sounds, creating a wonderful atmosphere for the show. The voice acting is on par with the other production aspects of the show, with charming and frequently heart-rending performances summoned by the various actors. There are a number of characters in this series, and skilled voice actors help make each character a unique part of The Twelve Kingdoms. Extras for this volume include a list of the various monsters, or Youma, that Youko encounters, an encyclopedia of the world, a map, and a textless version of the closing animation. I'd rave about this more, but I really should be moving on to other things right now. The faster I can finish these other series, the faster I'll be able to watch more of this amazing series. This just proves that the best way to show a fantasy series is through animation. That way, you have plenty of time to develop the plot and the characters, and you don't need millions of dollars for special effects. This is the closest thing to a perfect show I've watched in a long time, so by all means, chance a trip to The Twelve Kingdoms. It's worth it.